Book launch with readings by Aaron Rose and Mandy Kahn, and opening of installation by the book's designer, Brian Roettinger. Collage Culture points to the 21st century as an era of collage, in which creative works are made by combining elements from the former century. Why have musicians, writers and designers fallen in love with the past, busying themselves with the borrowed, instead of creating their art from scratch? In an essay called "The Death of Subculture," Aaron Rose urges a new generation of artists to end the collage era by adopting a philosophy of creative innovation. Mandy Kahn's essay "Living in the Mess," considers whether the collage of references that surrounds us might negatively affect the way we feel. The book's designer, Brian Roettinger transforms the text into word pictures, made in collaboration with artist/programmer Chandler McWilliams by translating 25 compositional rules into a computer application that generates collages. 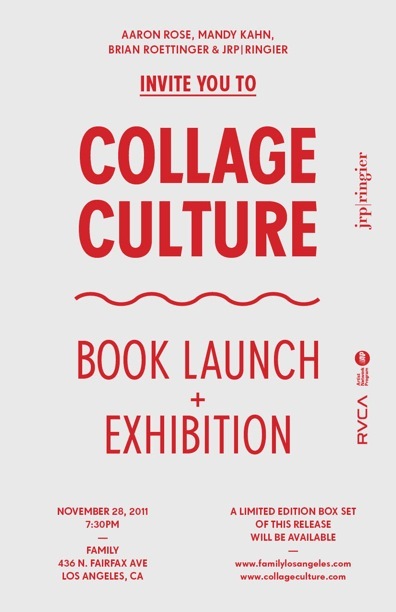 This application will be installed in the gallery and event-goers will be able to create and print collages using the same process developed to make the book's art. with an original score by No Age, released on PPM. OFWGKTA’s output goes beyond music and into a mastery of diverse media: photography, mixtapes, writing, design, self-made videos, and collage. 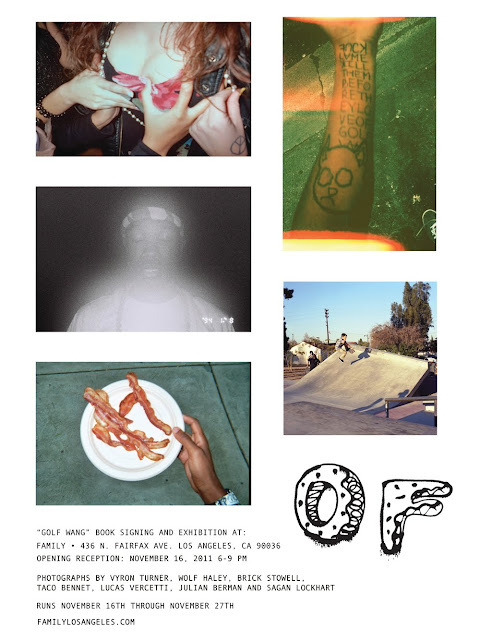 FAMILY is proud to proud to present an exhibition of this work, much of which has been collected in the new book, Golf Wang (Picturebox), with contributions from Odd Future and their wider circle of friends: Vyron Turner, Wolf Haley, Brick Stowell, Taco Bennett, Lucas Vercetti, Julian Berman, and Sagan Lockhart.